Vyacheslav Artyomov was born in Moscow in 1940. Although his father was a musician and although he, himself, began to study piano at the age of six, he later, at his parents’ request, studied mathematics and physics in preparation for a career in science. At the age of 18, however, Artyomov decided to devote his life to music and began to compose seriously. He finished the musical college affiliated to the Moscow Conservatory in 1962 (composition class of Aleksandr Pirumov), then continued his studies in composition under Nikolai Sidelnikov and piano under Tovi Logovinsky at the Moscow Conservatory, from which he graduated in 1968. In spirit, Artyomov considers himself to be an adherent of the Romantic tradition. As a young composer, he developed a profound interest, successively, in Russian folklore, traditional FSC Artyomov Self-description Philosophy Artyomov about (Artyomov’s) music About Vyacheslav Artyomov’s music music of the East, works of Prokofiev, Stravinsky, and later, Stockhausen, Messiaen, and the Polish avant-garde. But it was Arthur Honegger’s Symphonie Liturgique, as well as the works of Edgar Varиse, that made the greatest and most lasting impression on him. These are works which he deeply reveres to this very day. The main body of Artyomov’s work consists of over 60 titles, but these do not include several dozen pieces for various kinds of instruments or for orchestra, written for different occasions, as well as music for films and stage. An examination of his music reveals an interest which ranges from the archaic (Incantations, Totem) and Christian motifs (Requiem; Ave, Maria) to Eastern meditation (Awakening, A Symphony of Elegies, Moonlight Dreams). For Artyomov, all elements of musical language serve one main purpose – penetration into the deepest levels of an inner world, discovering of the “Other World” in oneself. This process can be morally perfecting to both composer and listener: Artyomov believes in the transfiguration of the created world through music. For many years political conditions in Russia mitigated against his works being performed with any regularity, if at all. This was true even in 1979 when his compositions became a regular feature of major European Festivals and various concert venues – in Paris, Cologne, Venice, Warsaw, London etc. 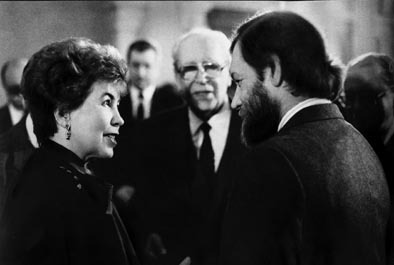 In spite of the opposition of the Soviet bureaucracy in the early 80s Artyomov began his own musical “perestroika”of the society, and with the help and participation of his wife – the poetess Works Publications Selected bibliography Selected works CDs The New Times (in Russian) Valeriya Lyubetskaya – he was able between 1981-86 to organize a series of performances of his own music, using some of the best Soviet performers. These performances were very successful, and some of them were even recorded by the All-Union Radio. Concert of the 13 became the first of his orchestral works which – thanks to the efforts of his friends Konstantin Krimets, conductor and Aleksandr Rabinovich, pianist – Artyomov heard during recording in Tallinn in 1970. This Concert was later recorded twice more – by Gennadi Rozhdestvensky, conductor, and Piotr Meshchaninov, pianist, as well as by Virko Baley, conductor, and Mykola Suk, pianist, prior to its first public presentation in Las Vegas, Nevada, 1990. The performance of the first version of his large symphony Way to Olympus by Veronika Dudarova and the Moscow State Symphony Orchestra in Moscow in 1979 and in Warsaw in 1980 had a great importance for Artyomov. Way to Olympus was the first symphony out of four in the cycle Symphony of the Way on which Artyomov was working over 20 years. The final version of this symphony was later brilliantly recorded by Timur Mynbayev and the USSR State Symphony Orchestra. 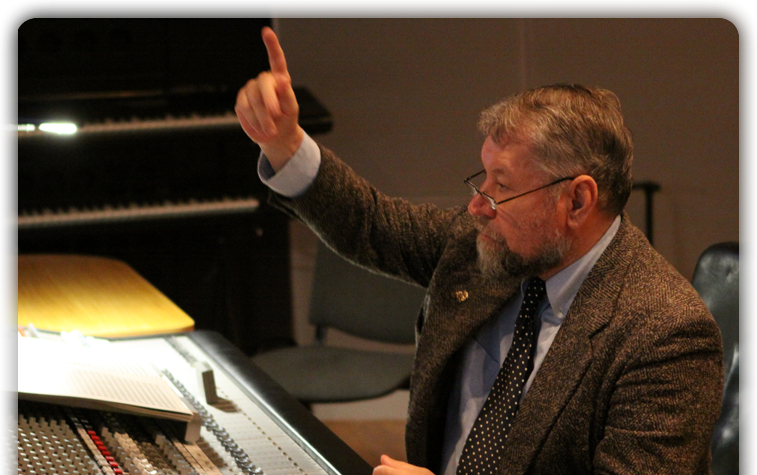 During 1978-1991 Artyomov spent much time and energy on the recording of his orchestral and chamber compositions. His music has been performed by the best conductors of the Soviet Union – G. Rozhdestvensky, D. Kitayenko, V. Fedoseyev, T. Mynbayev, V. Kozhin, S. Sondetskis, F. Glushchenko; by such internationally known pianists as S. Bunin, D. Alekseyev and A. Diyev, violinists L. Isakadze, O. Krysa,T. Grindenko and V. Igolinsky, and organists O. Yanchenko and A. Semyonov. He has also collaborated with such recognized singers as L. Davidova, L. Piatygorskaya, M. Mescheriakova and N. Lee, as well as many outstanding woodwind and percussion players. Some of his recordings made in Moscow were conducted by American conductor-composer Virko Baley, music director of the Nevada Symphony Orchestra. As a result of such activity Vyacheslav Artyomov’s works are available on 6 LPs and 5 CDs on the Soviet label “Melodiya”, on 4 LPs and a CD on the label “Russian Disc”, and a CD of “Solyd Records”. His compositions are also available on 3 CDs in the United States (“Mobile Fidelity”), 5 CDs in England (“Olympia”), and on LPs in France (“Le Chant du Monde”). The CD of the symphony Way to Olympus, released in the United States, was nominated for two international prizes. In 1998 “BMG Classics” released an Artyomov’s CD with some orchestral works as the first in a seria of Soviet music called “Musica non grata”. 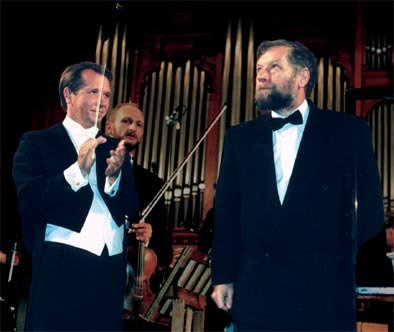 In addition to the above mentioned performances and recordings, Mr. Artyomov counts among the most significant of his musical events a premiere of his Requiem (for 6 soloists, 2 choirs, organ and big orchestra, lasting 80 minutes), which took place in Tchaikovsky Hall in Moscow in November, 1988, under D. Kitayenko, and dedicated to the memory of victims of communist terror in Russia, and the premieres of his symphonies On the Threshold of a Bright World, Gentle Emanation and The Morning Star Arises (all – parts of the cycle of four symphonies entitled Symphony of the Way), performed by M. Rostropovich and the National Symphony Orchestra at the Kennedy Center in Washington, D.C. in September, 1990 and in January, 1992 as well as by Mr. Rostropovich and the London Symphony Orchestra at the Barbican Centre in London in July, 1993. 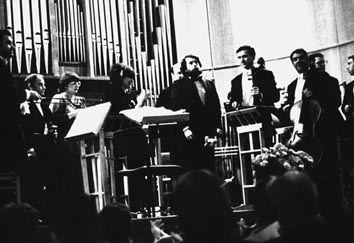 The performance of Requiem in Moscow provoked an avalanche of press reviews in the Soviet Union and abroad. It became the first Requiem Mass ever to be broadcast over Moscow State radio and it was nominated for the State prizes in the Soviet Union, and – later – also in Russia, and for the Grawemeyer Award in the United States. In 1990 Artyomov was “composer-in-residence” at the University of Nevada, Las Vegas and for the Las Vegas Symphony Orchestra. 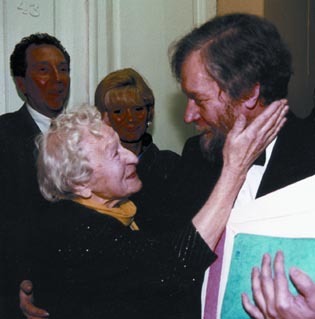 The premiere of his Pietа for cello and orchestra took place in Las Vegas in November, 1992 with M.Tchaikovskaya, cello, and the Nevada Symphony Orchestra, with Virko Baley, conducting. 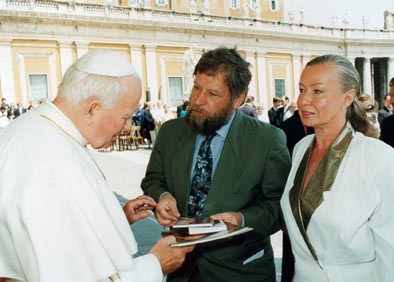 In 1992–95 two significant Russian TV companies, “Ostankino” and “Russian TV”, prepared ten TV films about Artyomov and his music, including full Requiem, the cycle Symphony of the Way and the premiere in London. The “Artyomov-Festival of premieres” took place in Moscow and Yaroslavl in November–December, 1994. It engaged the best performing forces of the country.The Moscow part of the Festival included two symphonic concerts, three chamber concerts and three ballet performances on Artyomov’s music. The Festival concerts were broadcast by the “Russian TV” and reported on CNN. A special TV film after the Festival was shown in the spring of 1995. In 1996 Artyomov was invited to lecture in some Californian Universities. The “Artyomov Festival” took place in Amsterdam in February,1997. It included two concerts, lectures and films on Artyomov’s music. 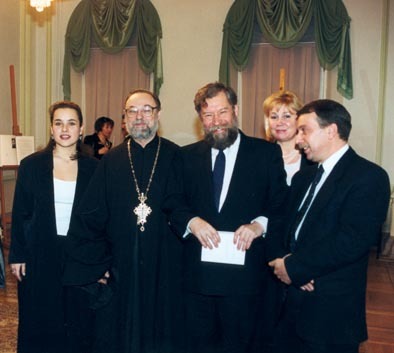 On November, 7, 1997 and November, 7, 1998 Artyomov’s Requiem with great success was performed at the Great Hall of the Moscow Conservatory by the Russian National Orchestra, the Kaunas State Choir, the Children’s Choral Studio “Vesna” and soloists with Virko Baley (1997)and Mikhail Pletnev (1998), as conductors. Those performances established an unofficial tradition of marking the Memorial Day dedicated to the victims of the Bolshevik regime in the USSR. Artyomov is a full member of the Russian Academy of Natural Sciences. Artyomov’s works were published by “Muzyka” and “Kompozitor” (“Sovetski kompozitor”) in Moscow, and by C.F. Peters in Frankfurt, Germany. Selected works of his have been reedited by the composer and are published by “Muzyka” and “Agar” in Moscow.